GRIFFITH, IN. — Retired NBA star Rick Barry is scheduled to sign autographs at Bridges’ Scoreboard Restaurant from 6 to 8 p.m. on Jan. 22. The restaurant is located at 121 N Griffith Blvd in Griffith, IN. Autograph tickets are currently on sale. Advance autograph tickets are $30 (1 autograph) or $50 (2 autographs). Tickets at the door are $40 (1 autograph). Photos of Rick Barry will be on sale for $10 each. 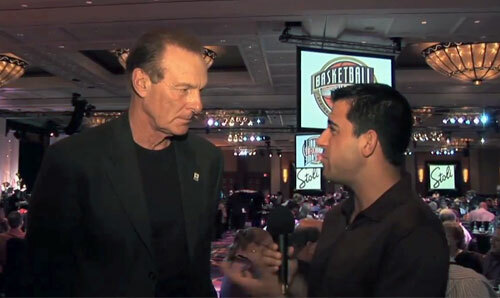 Photo shows Hall of Famer, Rick Barry, speaking with Harry Cicma in a 2011 interview. Barry is considered by many to be the greatest small forward of all time due to his very precise outside shot, knowledge and execution of team defense, and demanding will to win. The NBA Hall of Famer is known for his unorthodox but accurate underhanded “granny shot” during free throw shooting. He is one of a few elite players who have altered their games without losing effectiveness. Watch 2011 video where Hall of Famer, Rick Barry, speaks to Harry Cicma about his passion for basketball. Sports Speakers 360 is a booking agent for motivational sports speakers. If you would like to book NBA legends or athletes like Rick Barry for a speaking engagement, personal appearance, endorsement, or corporate event, contact our booking agent for appearance and speaker fees at Sports Speakers 360 or call 1.855.303.5450.